The Terra lawnmower robot has been in development for ten years and was unveiled behind closed doors during the CES. 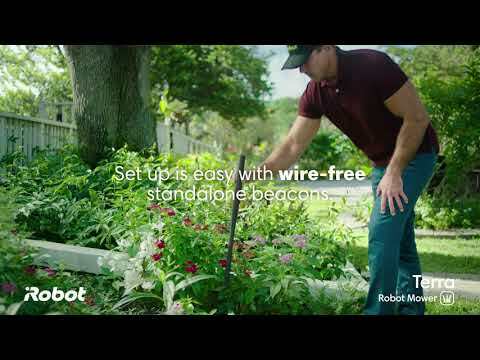 Users are able to adjust the desired grass height via the iRobot Home App. In the app you can also manage the route and a schedule. The Terra works with a kind of marking system, which has to be installed in advance. The system consists of wireless beacons. These are placed where the lawn ends. In cooperation with the app, users must manually move the lawnmower over the lawn once during the first use to teach the device where to mow the lawn and especially where not. From that moment on, the device is completely autonomous. The Terra can 'only' an hour ahead on a full battery. This is not very long, but if the device detects that the battery is running low, it drives itself to the charging station. With a fresh battery, the device will continue mowing. According to the manufacturer, the lawnmower is able to repel hard objects such as stones, so that the blades cannot be damaged by them. The device would also be resistant to rain.